We’ve all heard the story of the great team that has that one year where people question how the state of the team because of a drop-off. Well, it’s come that time at Laurier. Another blown lead in the second half and a third straight loss, as the Golden Hawks lost to the Guelph Gryphons, 27-24, on Homecoming. Guelph came out strong first, as they opened the scoring on a 72-yard pick six by linebacker Job Reinhart after Tristan Arndt’s pass was tipped at the line of scrimmage by a Guelph lineman. After Laurier tied it up, Kurleigh Gittens Jr. would break the game open for Laurier as he returned a punt back 80 yards to take any momentum Guelph may have had at that point. Laurier would go on to finish the first half strong up 24-10, despite Arndt having thrown three interceptions. The second half would be all Guelph as they held Laurier scoreless and their defence would carry them through. After a rouge point off Gabe Ferrero’s missed field goal, Guelph would have their own game breaking moment. Dotun Aketepe would take an interception tipped by a Laurier receiver back to the house for 69 yards to bring the Gryphons within six points in the third quarter. From there, their defence would give the offence their shot as they went on a 4-play, 56 yard drive capped off by running back Jewan Jeffrey to take the lead. 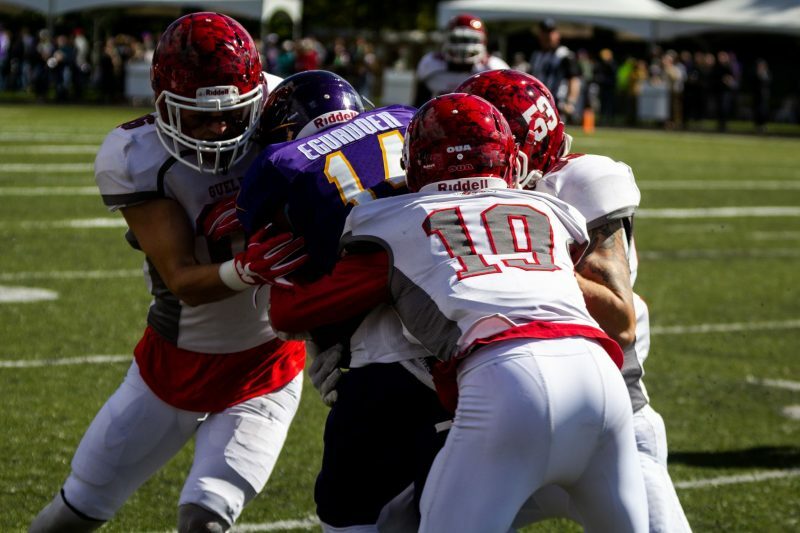 Arndt would go on to be benched after throwing six interceptions, in favour of Connor Carusello but Laurier just could not drive the ball down the field to get a scoring opportunity as they would go on to fall 27-24 on homecoming. Falling to 2-3 and being eighth in the OUA standings right now, things are not looking very bright for Coach Faulds’ squad. “It’s extremely dire [team’s situation], I told the guys all week, this was a playoff game and you kinda felt the playoff intensity and the Carleton game is definitely a playoff game now too,” he said.